Jazz Stream Records is proud to announce that we now exclusively use Analysis Plus cable systems when recording, mixing and mastering. Jazz Stream Records is always searching for new ways to produce a higher quality product, and we believe you will hear the difference. 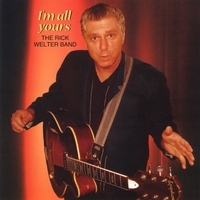 The Rick Welter Band "I'm All Yours" ON SALE NOW! Sixteen Strings at the Woodshed. ON SALE NOW! "I Had a chance to listen to the new Super Audio CD and I like what Jazz Stream has done here. It works well and Keefer's skills as an engineer are apparent here, as the disc offers some very clean vocals and accurate capture of the music. I think jazz fans will like this one"
"She ranges from a light little-girl sound such as on "Tenderly" to the world-weary cabaret singer on something like Kurt Weill's "Speak Low", to bluesy black soul shouter on "Black Coffee". Her live audience clearly laps it up, and the surround mix makes you part of that supportive audience". "This marks a good start for the new label and I wish them well". "This album consists entirely of covers – The Shadow Of Your Smile, I’ve Got You Under My Skin, Save Your Love For Me (check out the magnificent bass solo! ), Tenderly, etc. – but if you think you might be bored hearing one more version of Night And Day, think again. Matassa and gang have the uncanny ability to breath new life into these old chestnuts. I also need to give a big nod to producer David Keefer. Sonically speaking, this is one of the best live recordings I’ve heard in quite some time. Absolutely superb all around. I’m so used to hearing live recordings with too much bass, not enough drums or too much reverb on the vocals that I almost forgot what a live recording should sound like. It’s nice to be reminded." 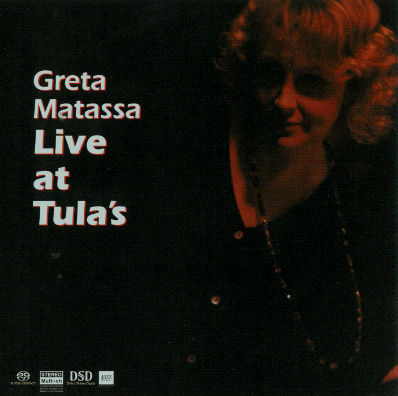 "Backed by her bandmates, pianist Randy Halberstadt, bassist Clipper Anderson, and drummer Gary Hobbs, Matassa is captured in a very conducive atmosphere where her way with both the songs and the crowd are fully realized. Greta Matassa has a wonderful voice, a way with phrasing, and a purpose to her improvisations, together with an understanding of what it takes to get her audience excited. Another salient point to Live at Tula’s is just how well it captures the feel of being inside the club, with a table in the front row, surrounded by the crowd, listening to a singer supported by a trio of sympathetic musicians. This album catches that mood and transmits it very, very well. If I closed my eyes, I could easily imagine being transported to Tula’s. And while this was true no matter which format I listened to (stereo CD, stereo SACD, or multichannel SACD), it was really brought to the fore in the multichannel mix. There, Matassa and company are spread out before you, with plenty of space between and around them. The crowd noise comes from all about your listening position. Keefer really captured the feel of that night on Live at Tula’s, and that goes a long way toward making this disc highly enjoyable." 2-Channel/Multi-Channel, exclusively distributed by Elusive Disc.